These SACD jackets feature printed wraps mounted to chipboard shells, producing an authentic, "old school" look and feel. Some people call these "mini LP" jackets. 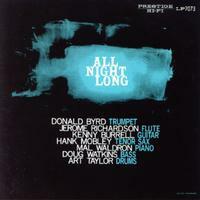 One of the great jam session recordings of the 1950s, All Night Long was under the relaxed direction of Kenny Burrell. The guitarist gathered together some of the finest young players on the New York scene, including Donald Byrd on trumpet and tenor saxophonists Hank Mobley and Jerome Richardson, one of the unsung heroes of the flute in jazz. Mal Waldron, Doug Watkins and Arthur Taylor were the rhythm section. The musical formats were uncomplicated; "All Night Long" a blues with a bridge, Waldron’s "Flickers" a 16-bar pattern, Mobley’s two originals based on familiar 32-bar chord sequences. From these simple, classic bases were launched performances with the hallmarks that have long identified any Burrell project: Relaxation, swing and high standards of musicianship. This Hybrid SACD plays in both CD and SACD players, as well as all SACD-compatible DVD players.